You'll not only get a bird’s eye view of Ambrym Volcano with its two active cones, Marum and Benbow, but you will also get the chance to feel the power and heat and hear the roar from the continuously boiling ‘lava lake’. This is one of the only places in the world you will get this opportunity, as we land on the crater rim and safely walk you to the edge of a 400m cliff so you can look over and see straight into the heart of the earth! Ambrym is a volcanic island in the centre of the Vanuatu archipelago and is in a state of constant activity. When Ambrym erupted over a thousand years ago, it ejected 25 cubic kilometres of earth into the atmosphere. Today, on the Volcanic Explosivity Index, it is rated around 0-1. While it is still releasing a lot of smoke, some ash and the occasional rock or two it is generally safe to be visited. In recent years it has also oozed a slow lava flow from within the caldera. 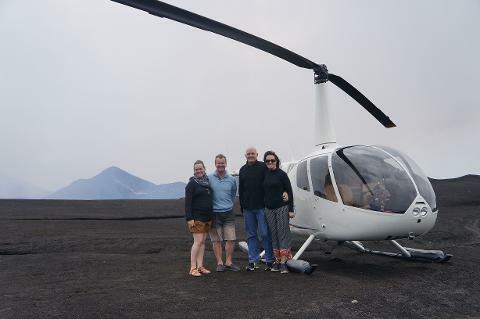 Our Vanuatu volcano flight takes around 3 hours to complete. 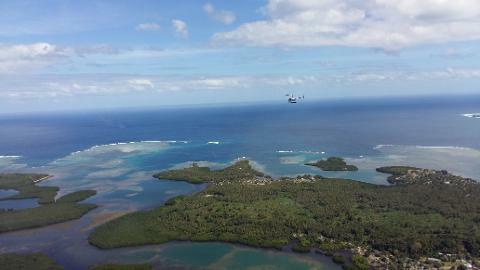 Approximately 2 hours of flying time, making it an ideal half day tour for those staying in and around Port Vila. Your flight starts in Port Vila from a floating pontoon, a short boat ride from the seawall where our office is situated. The flight takes you north for an hour passing the remote islands of Emai, Epi, Makura, Paama and the stunning Cooks Reef. Once we reach Ambrym you will see the old lava fields and the vastness of the caldera covering 100 square kilometres. 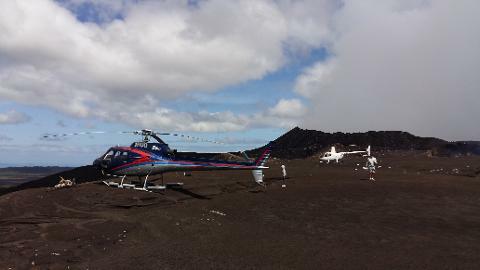 We land the helicopter close to the crater rim. Walking on the surface gives you a feeling of what it must be like to walk on the moon, not a plant or living creature in sight, just black earth, stunning rocky formations and mist creating a very outer-world experience. Without vegetation to hold the ash in place, the frequent tropical rainstorms carve great gouges in the land, forming surrealistic moonscapes. Walking through the maze-like river flows cut in the Ash Plain is an awesome experience. 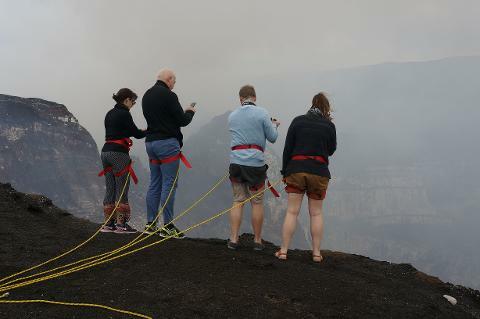 At all times your safety is our number one priority and you will be required to wear a safety harness allowing you to get spectacular views of the lava lake. The journey home passes over endless stunning, lush, tropical rain forest covered islands with white sandy beaches and large coral reefs. You may even get the chance to spot some marine mammal wildlife such as a pod of whales, dolphins or dugongs and of course turtles. Full commentary from your very experienced pilot. Our pilots have been flying in Vanuatu for many years and have excellent local knowledge. 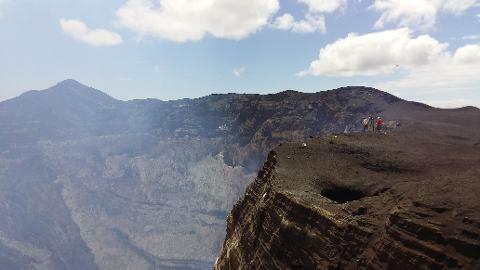 Fly direct from Port Vila to the crater rim. No need for long bumpy road travel. Our helicopters have air-conditioning for your comfort. Helicopters are equipped with noise cancelling headphones, which also allow you to talk to the pilot and other passengers. Birds eye view of the volcano from the helicopter and from the ground. 2 hours of some of the best scenery Vanuatu has to offer. 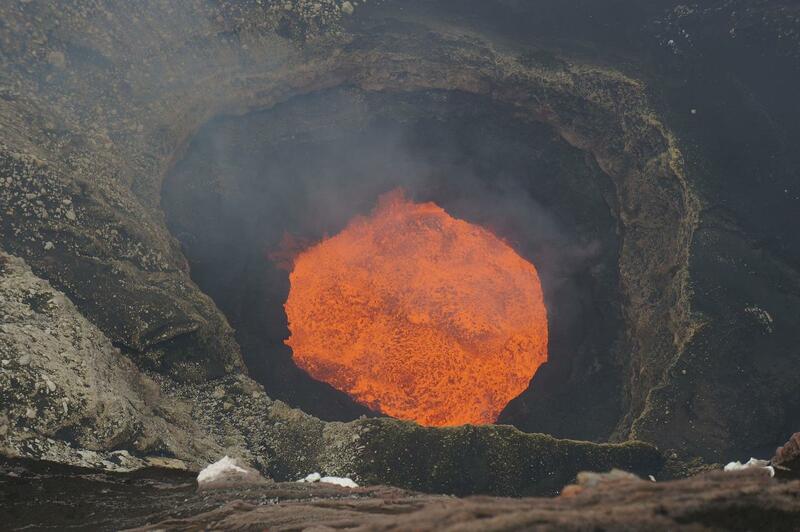 You will most likely be the only people on the volcano - so no big tour buses! What to bring: make sure to pack a warm jacket as it can get very windy and cold at the volcano. Sunglasses. Camera. Water or refreshments.